A terrified mother and child’s final moments after the devastating Pompeii volcano have been unearthed for the first time in 1,900 years. It’s been nearly 2,000 years since the deadly Pompeii disaster but one of its most tragic stories is just being fully revealed. It is thought the child, who was around four, had run to his mother as Mount Vesuvius erupted and covered the Roman town in ash in 79 AD. The substance had preserved the skeletons. ‘It can be very moving handling these remains when we apply the plaster,’ conservator Stefania Giudice told journalist Natashas Sheldon. 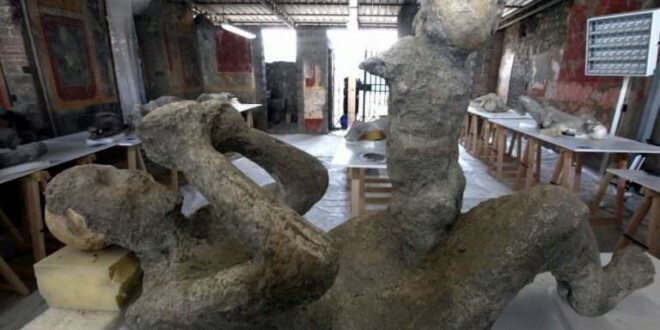 The scene, which was made even more tragic by the presence of the boy’s ‘father and sibling’, is part of restoration work and the study of 86 casts in the laboratory of Pompeii Archaeological Site. I visited Pompeii over 40 years ago and saw these figures exactly where they lay in the open. I distinctly remember seeing the remains of a dog. I’ve since visited Pompeii several times and it never fails to fascinate and make you stop and think of the terror these people endured, from all social classes. Best time to visit is in March, not too hot and not many tourists. A definite must-see. It seems that about 100 years is the cut off point to when the remains of a person are treated as an artifact rather than a person. It’s nice that there are a few people left who have respect for all human remains. I was there in April -the dog is still there and a few bodies. Too tragic for me. They should just bury them and let them rest. Pompeii is situated lower down on the ‘leg ‘ of Italy…. Where the front part of the foot meets the ankle! What’s it matter? it’s just a collection of elements by then. All of these bodies are slaves who were ordered to stay behind…white slaves. Their owners fled. The bodies are not “petrified”, but hollow impressions in the hardened ash and pumice. I think that they would be happy to know that thousands of years later, people learn from and respect their remains. It moves me to think that they were people, just like you and I, who endured a horrific experience. I hope they did not suffer. I find this so disrespectful. I will never understand why anyone thinks they have the right to intrude on a persons remains. It isn’t just a matter of privacy for those left behind, but the right of the person involved in the death to be left alone. I’m going to cheat these legalized grave robbers and be cremated.